Blue Mt. Dine’ Inc. Indian Art Market, Blanding Ut. Sharlot Hall Museum Native American Indian Art Festival , Prescott Az. 26th Annual Red Earth Festival, Oklahoma City, OK.
27th Annual Boulder City Fine Art Festival , Boulder NV. 23rd Annual Totah Festival Farmington Civic , Farmington NM. 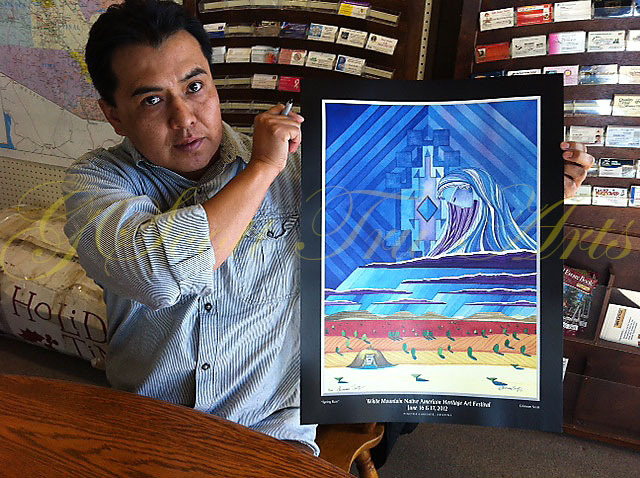 62nd Annual Navajo Festival of Arts & Culture, Museum of N. AZ. 24th Annual Native American Arts Festival, Pinetop Lakeside Az. 25th Anniversary Red Earth Festival, Oklahoma City, OK. Edge Of The Cedars Museum Indian Art Market, Blanding UT. 26th Annual Boulder City Fine Art Festival , Boulder NV. 18th Annual Southwest Indian Art Fair, Az. State Museum, Tucson Az. 22nd Annual Totah Festival Farmington Civic , Farmington NM. 23rd Annual Native American Arts Festival, Pinetop Lakeside Az. Mesa Verde Indian Art Market, Mesa Verde N.P. Co.
1st Place Painting, All Pieces Juried Collectively.